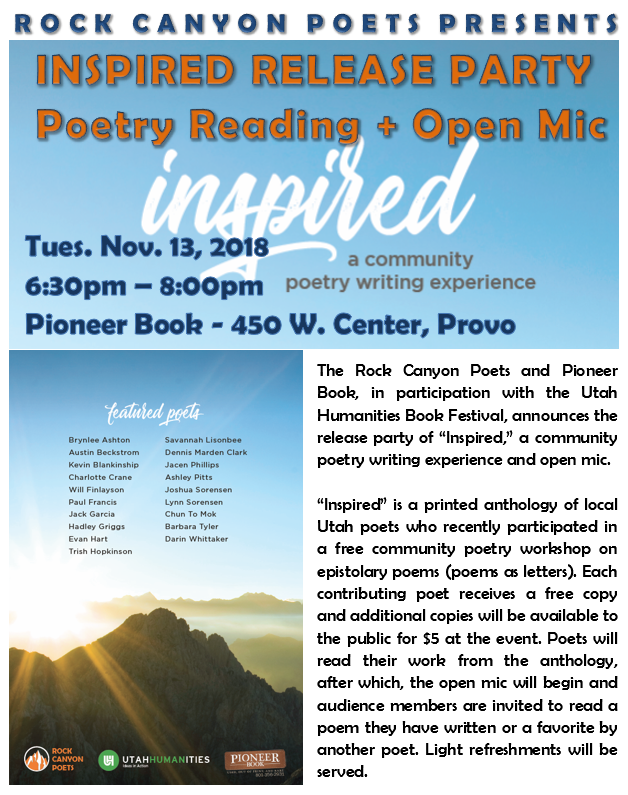 The Rock Canyon Poets and Pioneer Book, in participation with the Utah Humanities Book Festival, announces the release party of “Inspired,” a community poetry writing experience and open mic on Tuesday, November 13, 2018 at 6:30 pm. “Inspired” is a printed anthology of local Utah poets who recently participated in a free community poetry workshop on epistolary poems (poems as letters). Each contributing poet receives a free copy and additional copies will be available to the public for $5 at the event. Poets will read their work from the anthology, after which, the open mic will begin and audience members are invited to read a poem they have written or a favorite by another poet. Light refreshments will be served.